Daily Illuminator: Munchkin Messenger Bag Contest Winners! December 9, 2016: Munchkin Messenger Bag Contest Winners! Congratulations to our winners! This bag of joy will bring you lots of wintery wonder this holiday season. Make sure you follow us on Twitter, Facebook, and Instagram for more chances to win! If you didn't win, don't worry! These bundles are available on Warehouse 23 until December 15. But make sure you get yours soon, because Warehouse 23 closes that same day! We have to load the sleigh, feed the reindeer, and . . . listen, we're not elves – we have to go home for the holidays. But before we head back to the North Pole (hey, rent is cheap, you'd live there too), be sure you take advantage of our other Warehouse 23 deals! 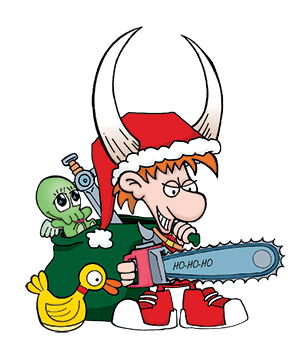 Like Holiday Grab Boxes, with over $80 worth of items for $40, plus you might get something signed by Steve Jackson! If a blind box isn't your style, but you still want a bundle of games, our Holiday Bundles are a great gift for fans who want it all! You can also save 40% on GURPS PDFs, as well as 20% off of Munchkin comics by BOOM! Studios, for all the readers in your life. And no matter what you order, you're getting triple the free swag with your order, including the new Mr. Freeze promo for Batman: The Animated Series Dice Game! Make sure you follow us on social media for more chances to win awesome holiday loot, and get your orders in on Warehouse 23 before they close on December 15! One last special note to backers of the Dungeon Fantasy RPG Kickstarter – The BackerKit survey closes today! Make sure you have responded to the survey so we can fulfill your rewards!